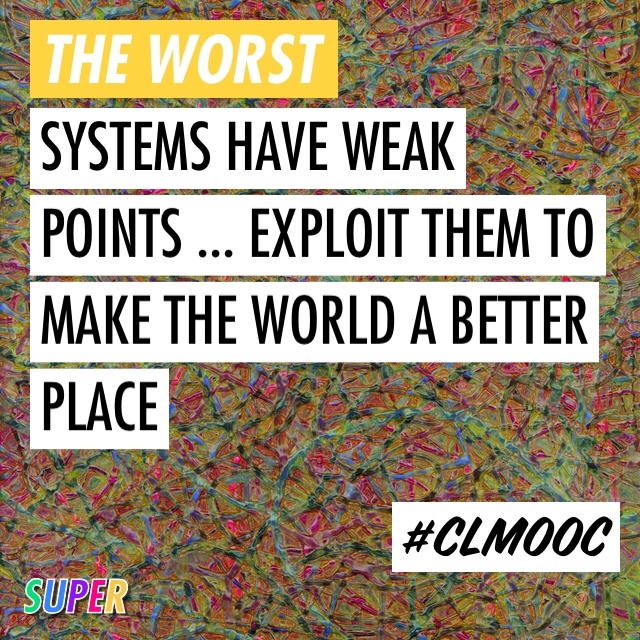 I’ve been up and down with systems thinking all this week in the Making Learning Connected MOOC. 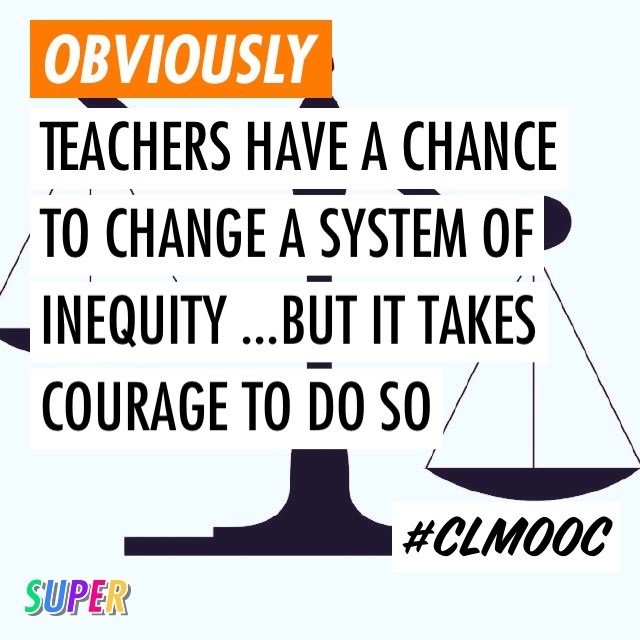 What I mean by that is that I’ve had days where I have been playing with a systems thinking approach and other days where thinking about systematic inequities has me struggling with how to address problems that seem larger than me. 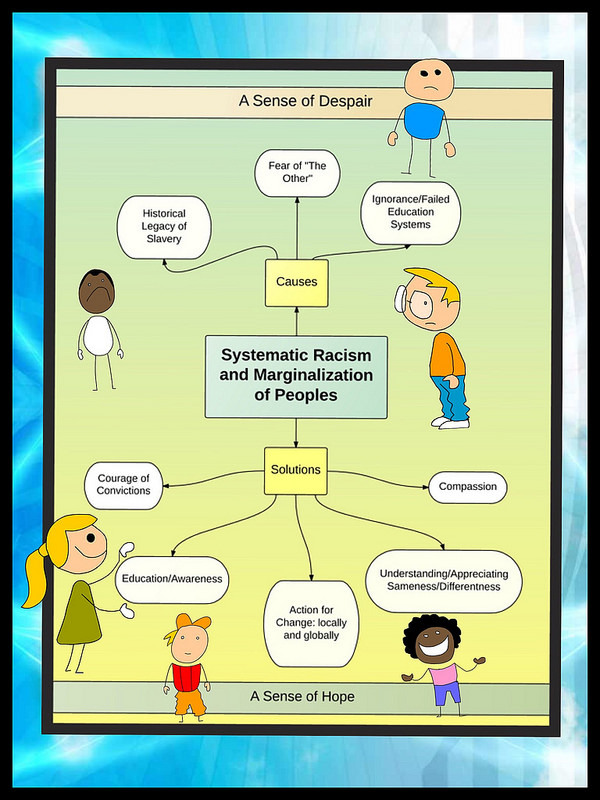 The chart above is something I made the day after being a guest on Teachers Teaching Teachers, where our topic of discussion was systematic racism and disenfranchisement. The show had an article adapted in The Atlantic from Ta-Nehisi Coates’s new book — Letter to My Son — that we collaboratively annotated before getting on the air. This led to a discussion about race and the impact on students, and the role we have as teachers to try to make things better. I was honored to be in the conversation but struggled with my role as a white teacher in a predominantly white school district in a suburban community where so many of students have no reality of the world of black or Hispanic students in urban centers affected by socio-economic issues and police brutality and a political system often set up through gerrymandering to keep their communities out of power. It’s not that I don’t talk about race and slavery and the ways in which our country is both an amazing experiment in beliefs and one that was constructed on the most heinous of ideas — enslaving others to create a strong economy. But it often feels as if those discussions are not reality for my young white students, and I need to find more ways to bring the experiences of others into my classroom. I need to extend their world from beyond our classroom walls and the boundaries of their small community. I need to do that in a way that respects my students and respects the experiences of those we talk about. By the end of the TTT show, our collective message of compassion and understanding of those from different experiences than we have, and the need for real conversations about the real world with all of our students, continued to resonate with me. But I was also reminded by Chris Rogers that we need to move beyond talk, and shift into action to make change to the system. Everything might be broken, but if it isn’t teachers who can help fix it, then who?